I can remember my enthusiasm for early versions of Windows XP Media Center Edition and the promise of an integrated home theater experience built into Windows. One of the best things Microsoft did with Windows Vista was to include that Media Center experience as part of Vista, not just as a special version of the OS. The thing I didn't like about old versions of Media Center was the need for bulky desktop systems that took up tons of space and needed a permanent home in my home theater. 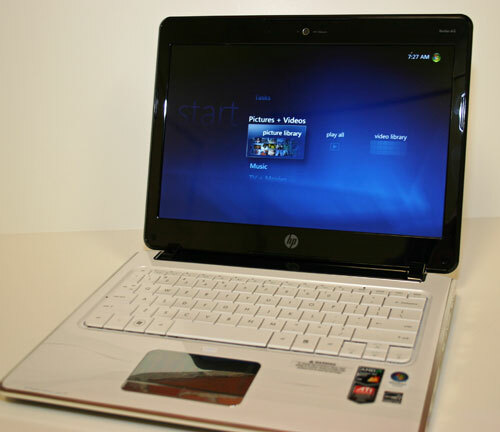 What Microsoft did in making Windows Media Center available on most consumer systems was allow me to have a highly portable home theater experience from something like the 1.73 kilogram (3.81lbs) HP dv2. A 12.1 inch screen might not be the ideal viewing size for your home theater, but you can still get the full Windows Media Center experience by way of HDMI-out on the dv2. When you're traveling on a plane, you won't have to worry about the dv2 screen getting crunched when the guy in front of you reclines his seat, because it's small enough to fit safely on the fold-down tray. You will need an additional USB TV tuner to record television with Windows Media Center, but the size of the dv2 makes it convenient to take your recorded television with you for viewing while you travel. Since many hotel rooms now include HDTV screens with HDMI in, you can take your home theater on the road, in a nice compact size, and still get the full viewing experience without needing a much heavier notebook. There's plenty of hard disk space with a base configuration of 250GB hard drive, so you can take your entire photo library with you anywhere you go. Here again, the HDMI-out comes in handy so you can quickly connect to a high definition screen to make sharing photos a group experience in anyone's house. And enjoying the comfort of your couch while browsing photos is far better than crowding around a computer screen of any size. One compromise I've often made in being portable is leaving some of my music collection behind while traveling. Here the dv2 helps create a solid portable Media Center experience by supporting your entire music collection while also maintaining a compact size. Unless you have an extremely large music collection, you should be able to carry everything with you on the dv2.